For other outdoor lighting, see our FireLanterns and Rustica Family pages. Super outdoor party lighting - great for lighting any outdoor event. Faro garden gas lights – a small gas light for table and walls; two sizes of ground or tub-spiked ones for garden or patio and outdoor functions. High-quality materials and construction provide lightweight, durable and rust-proof garden lighting. Completely mobile – no wiring or plumbing in. these delightful models are Designed to be left outdoors without rusting. M 1180 x 90 available from any D.I.Y. outlet. L 1905 x 90 Burns Up to 15 hours per can. Rio garden gas torches - two sizes of ground or tub-spiked models in stainless steel. Using the same widely available gas canisters as the Faro above, the Rio garden torches give lovely flickering flames that add a real atmosphere to gardens and patios. Non-corroding materials and maintenance-free. L 1200 x 130 Burn-time up to 7 hours. Goa garden oil flares – two sizes in wood, stainless steel and resin. 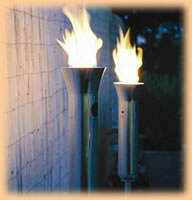 The Goa garden Flares and their typical oil flame now come with stands for use on patios and decking. extinguishing caps protect the wicks when not in use. Again, non-degrading materials preserve the beauty of these torches.